to get out and about in Salisbury when the snow was still fresh, but it was a lovely bright and crisp winter’s day. I’ve been slowly sorting through and editing all the pictures I took that day – To say I took a lot is putting it mildly, I’ve got macro shots, shots of Lizzie Gardens and The Cathedral and Cathedral Close. I’ve almost finished all the editing, just got 5 or 6 shots left I want to work on. However the set I named “Iced Rosemary“ is amongst my favourites and very much a standalone set in it’s own right. They were taken just down the road from where I live using my macro lens on the K7 Pentax DSLR. The sun was just perfect and the brilliance of the snow and the glow of the reflections in the ice droplets had me totally enthralled for quite sometime. I’m sure I got a few weird looks as people passed me by on the street, but what price the perfect capture? I have edited and uploaded the best of the iced rosemary shots to flickr and they can be viewed in the set conveniently named “Iced Rosemary“. However, here are a few of my absolute favourites and a little explanation as to why. I was fascinated by the way the iced droplet distorted the reflection in this capture. I also liked the contrasting textures of the wood, leaves and ice. 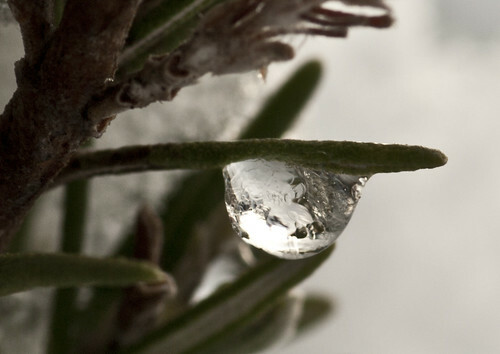 One of the many droplets that were starting to melt under the winter sun allowing me to capture a perfect reflection of the garden in which the rosemary resides. It took a few attempts to get a shot in focus with the right amount of light, but it was well worth the effort. 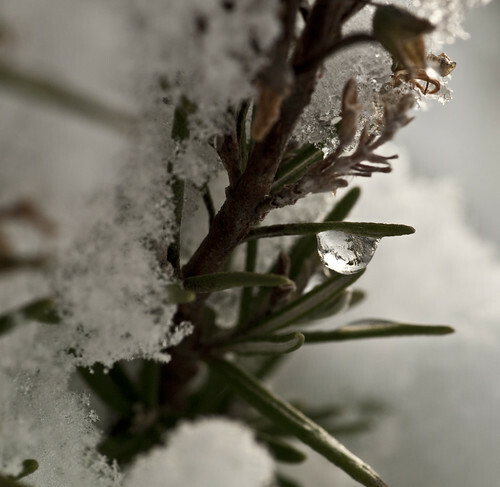 Part of me toyed with the idea of calling this one “reptilian rosemary” due to the pronounced textures of the rosemary sprig through the magnification of the ice. In the end I decided not to call it that, hoping that people would see the texture and make up their own minds about it. I really liked the overall tone and composition of this shot. The blurred snow in the background and the detail of the individual ice crystals within the snow in the foreground. 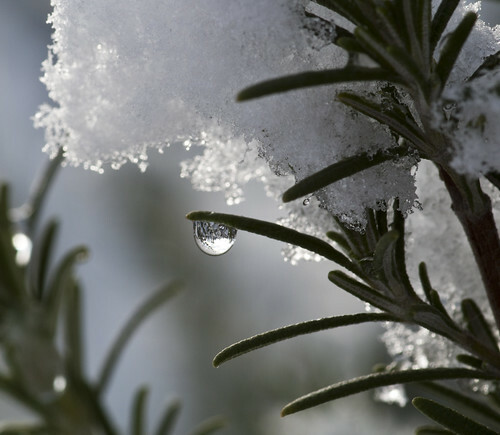 The smoothness of the rosemary sprigs, the roughness of the wood and the frosted glass effect of the ice droplet. It all added up to a beautiful shot in my eyes. 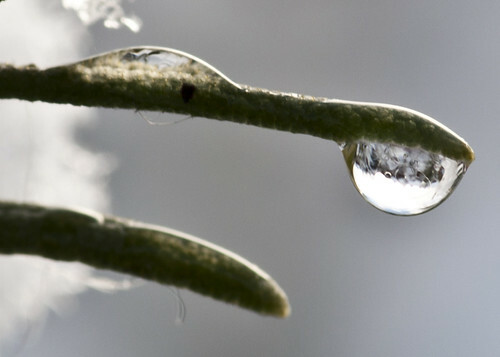 This entry was posted in My Art, My Blog, Photography and tagged countryside, droplet, english countryside, freeze, frost, frozen, frozen drip, frozen droplet, macro, macro lens, macro photography, nature, nature macros, photo, photograph, photography, rosemary, ruth weal, salisbury, seasons, snow, snowflake, wealie, wiltshire, winter, winter photography. Bookmark the permalink.